Great Lakes Artisan Box for sale. Buy online at Zingerman's Mail Order. Gourmet Gifts. Food Gifts. Foods from around the five Great Lakes. 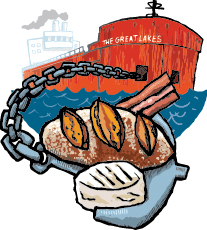 Twenty years ago it was a tough task to build a tasty collection of American artisan foods, let alone one strictly from around the Great Lakes. Times have changed. Today there’s such a bounty the tables have turned. The difficult job is not finding enough foods: it's editing the selection. Here are seven delectables that I think represent some of the ingenuity and resources of artisan food makers from our region. We stuff our cartooned gift box with Peanut Butter from Koeze in Grand Rapids, Michigan, American Spoon Preserves from Petoskey, Michigan, two bottles of Zingerman's Cold Brew Coffee, Mo’s Bacon Chocolate bar from Vosges in Chicago, Marieke Gouda from Thorp, Wisconsin, Nueske’s Applewood Smoked Bacon from Wittenberg, Wisconsin and our Cinnamon Raisin Bread. "The huge box full of goodies -- that amazing raisin bread, bacon, Gouda, peanut butter, jam, coffee, and chocolate in that fun, colorful box filled with pleated brown wrapping shards -- was without a doubt the best gift we have ever received (and we are OLD. We graduated from Michigan 50 years ago.)"